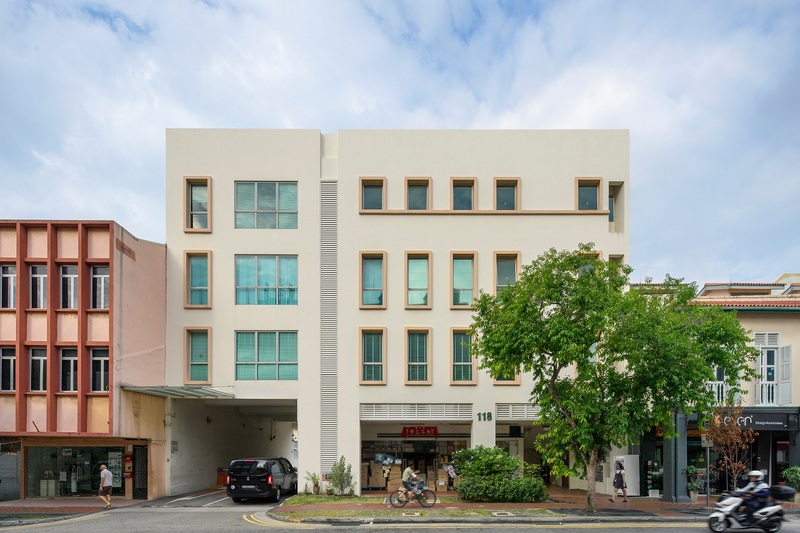 A freehold commercial building at 118 Joo Chiat Road has been launched for sale at a guide price of $20 million. The price translates to about $1,077 psf on the existing gross floor area (GFA). The four-storey building sits on a 4,686 sq ft site, and has a GFA of 18,571 sq ft. It comes with an attic and a lift. The building is zoned for commercial use under the 2014 Master Plan, and is currently approved for shops on the ground floor and offices on the upper floors. There is also a mechanical car park for nine cars in the building. The new owner could have naming and signage rights for the building. The existing tenancies could be terminated for an owner-occupier to move in immediately, or an investor could refurbish the building or change the tenant mix. Alternatively, the driveway could be decanted to make way for additional retail space on the ground floor. Based on a URA reply, up to 40% of the GFA could be considered for residential use, says Clemence Lee, senior director, capital markets, at JLL. The property is a 10-minute walk from Paya Lebar and Eunos MRT stations, and is a 15-minute drive to the CBD. It is also accessible by the Pan-Island and Kallang-Paya Lebar Expressways. The sale is through an expression of interest exercise, which closes on May 14.